There was a time when I was using organic solvents to remove beeswax; but it turned out that Carbosol was dangerous to the environment, and it was banned. Since other solvents don’t work nearly as well, I’ve returned to one of the traditional ways of removing wax–with a candle–for both my own work, and for classes. 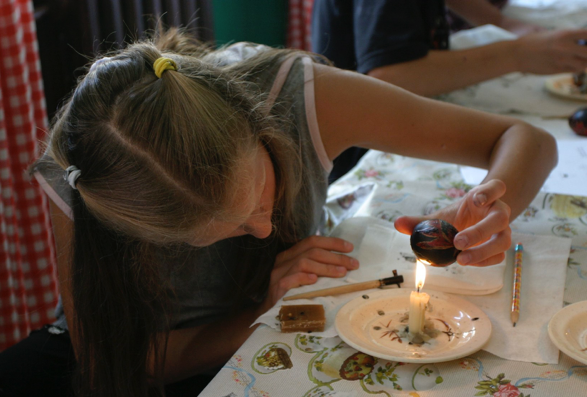 Additionally, once students get to the point of needing to remove the wax I will demonstrate the technique at each table once a finished pysanka becomes available. I reiterate the points above, remove some of the wax, and then allow the student to finish de-waxing it.